Discussion in 'Studio Scale Models' started by ShowCraft, Jun 20, 2006. Could be an impeller fan, though there are an awful lot of blades. The way the central hub widens out toward the bottom makes me think that. Or maybe a heat sink, a larger version of the ones on the X wing guns? Could it be the compressor fan part from the old 1/24th scale Harrier kit? The harrier part doesn't match, although that was a good thought. yep, must be scratchbuilt at the scale the RBR was. 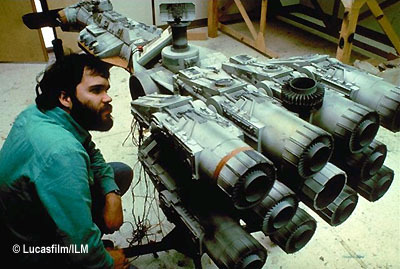 I'm pretty sure I've seen shots where the ILM model makers were installing the individual fins into the engine. I wish they were scratch built, though I sure wouldnt look forward to making eleven of those things. The bell shaped inner core and double decker fin set up with the lower fins being V shaped (fatter at the outer ends) tells me that this is an off the shelf mechanical part from maybe a home apliance or something like that. I'm sure you saw the pic on starship modeler with one removed, right...? Not too revealing, but every pic helps. Don't let that hold you back, Jim. Laser cut parts and a jig assembled from precision laser-cut parts and you will be rockin' and rollin'. Yeah, I know I'm going to end up scratching these things. I was just hopeing to be pointed in the right direction to finding out what they really are. I miss that AH HA... moment when after a long search, you finally find that oh so elusive part. Is this thread the first we've heard of your venture? Or did I miss something...? Almost looks like IGV vanes to a TF-33 to me. IGV who to a TF-333 what? :confused Had to google that one. The veins are straight front to back so that rules out rotors or blades. My guess is its something really lame like a coffee filter of some sort. Someone could always just ask Grant McCune HAH. Besides the inlet to an IGV to a TF-33 is about 5 feet. Studio Scalers--"Rotary Engine Mazda" RX2?